Create the perfect base for your makeup routine! 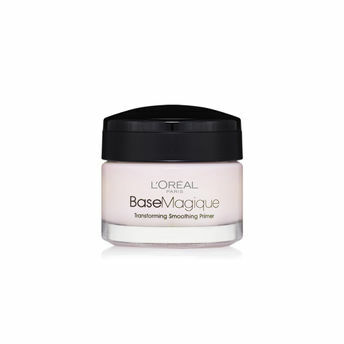 The L'Oreal Paris Base Magique Transforming Smoothing Primer instantly smooths pores and creates an even surface, so that you get a more flawless make-up result that lasts. The silky, lightweight formula glides onto skin and minimises the prominence of pores and fine lines to transform your skin surface. Thanks to a high concentration of elastomers, this Smoothing Primer gives skin an incredibly even surface with fine lines and pores erased. The formula also contains soft powders to help absorb sebum, thereby mattifying the skin to reduce shine. Smooth to touch and with a silk-like feel, silicon oil enables easy-gliding application with no greasy residue. Base Magique will guarantee a more perfect and longer-lasting make-up experience every time. Explore the entire range of Face Primer available on Nykaa. Shop more L'Oreal Paris products here.You can browse through the complete world of L'Oreal Paris Face Primer .